Yes we have had the "do you want to remain" vote and we told them no so now the vote should be how we LEAVE. It sickens me to hear those politicians who want to reverse the referendum but will not directly say so when asked. I think it is a remain unicorn and disrespect to the younger generation to think they all want to remain, although they have been brainwashed by the liberal left dominated education system. 60 % vote to leave, is that a big enough majority this time? I was not picking any single party out for the blame of this complete shambles they have left us in, they are ALL as guilty as each other. No, no, no. Steve, it was the government that put the referendum to the people. Having done so and got a result that they did not want, it is the governments job to deliver on the instruction of the people. Let us be clear, it is not the job of the opposition to deliver government business. This is about the Tory party – period. That is not a choice. I too, and with out doubt over 50% of voters would abstain. Any such referendum would be declared invalid. I think we need to understand that the 27 EU countries are now in control. Not because they want to be, but because May and her government are incompetent. So, what will likely happen this evening (in my opinion) is that parliament will vote by a substantial majority to reject NO DEAL. But that does not change reality. We will still be heading to NO DEAL. It is the current default position. The next vote may be to extend article 50. If that is what happens it will go through with a majority. That then goes to the EU. To get their agreement we will have to demonstrate that we have a way forward, or if we don’t have a way forward, we need to demonstrate that there is a plan that will lead to a way forward. The 27 countries will need to agree the extension. If we can’t demonstrate a way forward, they will not grant an extension to article 50. If that happens, your guess is as good as mine. The government may push May’s deal again (I kid you not) – they may drive us to a no deal. Or they may cancel article 50. And if not the parliament will have to force the government to cancel article 50. If May still tries to run the clock down, the EU may grant an emergency extension of a few weeks to allow our parliament to kill BREXIT. Remember what they say about Juncker. He might like a wee bevvy but he is one still of the smartest political operators in the world. What they say is – Juncker always gets what he wants. Congratulations to Steve10562cc. 100 pages dude. The most popular thread today on foc-u. Of course we coud still head towards a second referendum, or a general election. But whatever way you look at it May is a 100% failure. She's done as PM now. The EU are saying tonight that they won't grant an extension if May is just going to come back and try to make further changes to her deal. Her 'deal' is dead. Even her Chancellor is telling her to compromise. That's good news, but that does not mean that No Deal cannot happen. Perhaps we should sack all the MPs vote 650 new MPs who,s only qualification is common sense don't behave like a bunch of spoiled hooligan brats in parliament and have this countries interests at heart in stead of their own. They should all hang their heads in shame. My fear now is this. The ERG fear losing BREXIT altogether. They go to May and tell her they will support her deal. But with the support of the ERG and rebel Labour MP’s voting with the government or abstaining, May’s deal could go through on a 3rd meaningful vote. Remember May’s deal just kicks the can down the road. So once it is through the ERG can switch back to obtaining as hard a BREXIT as possible. Which could mean ten years of doing BREXIT. Why does May think she can bring her failed deal back 3 times, yet deny a second referendum? Bullying and blackmail, her only solution. No credibility whatsoever. She’s a bloody difficulty woman. A lot of MP’s are going to start shitting their pants now. May will be having a lot of private conversations over the next week. She’ll threaten the ERG with back me or no BREXIT. She’ll threaten others with a general election – you’ll lose your seat. She’ll threaten yet others that she will resign if they don’t vote for her deal – see how you get on you pricks. At the end of the day she cares more about herself then anything else. The ERG have repeatedly rubbed her nose in the dirt. Now she’s gonna pull the pin and go for her pound of flesh. It’s all or nothing for May. This is her last stand. May before country, May before her party, don’t mess with the bloody difficult woman. She might just yet get this through. Even the DUP will start shitting bricks in a day or two. Is there a single MP (our so-called elected REPRESENTATIVES) who is capable or willing to put our country ahead of their self serving,short term,private interests? I am totally disgusted at the shambles of all this f*****g nonsense. Maybe its time to change the whole bloody system and get some professional managers running the country instead of these greedy, out of touch, selfish braying donkeys. Makes me sick to be British! Lots of arm twisting and lying going on this morning. Attorney General's previous advice that Vienna Convention couldn't be used to remove NI backstop 'may have been wrong' . 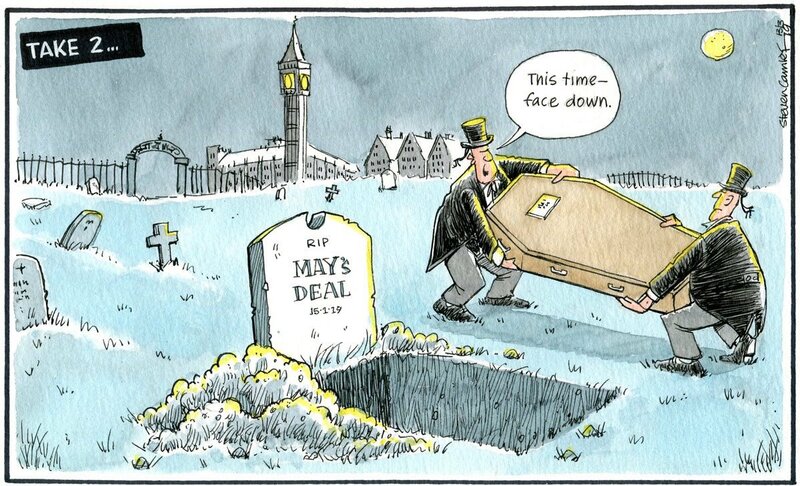 A stitch up is occurring at the moment to try and get May's deal through. This government, and May in particular are a disgrace.